This pr ogram is a very gentle introduction to a small group environment which allows children a brief time away from parents and a chance to get used to alternate caregivers and peers. The Toddlers, our 1-year-old program strives to provide each child with a sense of safety, security, and enjoyment as each experiences a new setting outside of his or her home. Daily activities will follow a similar schedule each day and will include a free play time when the children can explore the classroom and play or participate in a craft project, a short gathering time in which songs and movement are featured, playground time, and snack. 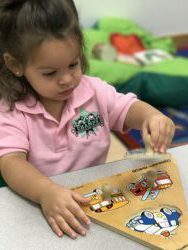 Every morning The toddlers will have many opportunities to exercise their gross and fine motor skills, explore social relationships, integrate more and more verbal communication into their interactions, and broaden their sensory skills. © CHAMPS BRICKELL 2019. Transcend theme by CPOThemes.